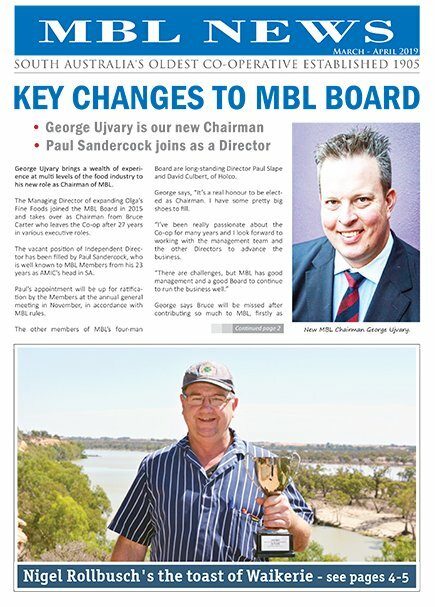 In this edition, some key changes to MBL's Board of Directors are announced. George Ujvary, Managing Director of Olga's Fine Foods takes over as our new Chariman and Paul Sandercock, well known to Members as the South Australian head of AMIC, fills the position of Independent Director. We farewell Bruce Carter who will be missed after contributing 17 years as General Manager and then serving on MBL's Board as a Director and Chairman for over a decade. Riverland Butcher Nigel Rollbusch storms a stunning national Sausage King win when rare sircumstances saw him represent SA in the Continental section at AMIC's annual national awards night in Fremantle in February. His Waikerie butchery, Rollbusch Quality Meats can now claim to officially be the home of Australia's number 1 continental bratwurst, a big achievement for a small shop in a small country town.